The popular online photo editor Picnik has been purchased by Google and will no longer be available to users without a Google+ account. 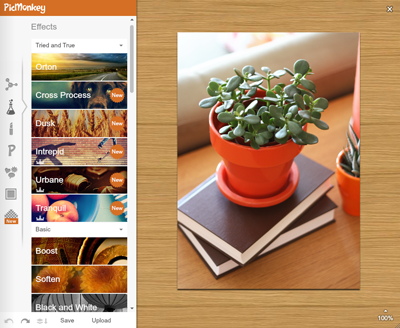 However, some of the Picnik team members have created PicMonkey, a new, free photo editor. Upload a photo and easily manipulate it in zillions of ways, from a standard crop and resize, to dozens of customizable effects including Polaroid, Holga, Lomo, film grain, and more. You can even add mascara and lip tint to your subject. The "weight loss" effect is funny, but I decided this plant did not require a diet. 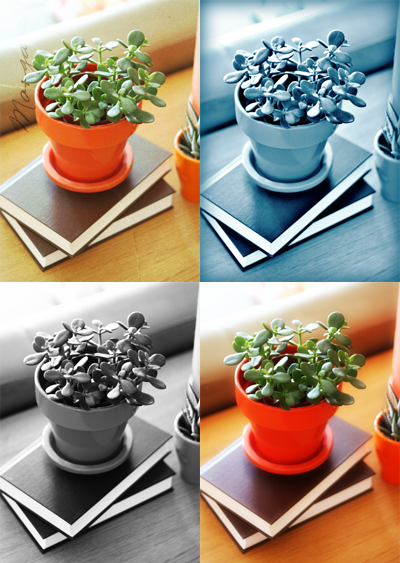 Altered photos can be saved as jpgs or pngs. Note that PicMonkey runs on Flash, so it won't work on the iPad. And a tip for entrepreneurs: it's cool to name your service after a primate these days. I'm thinking of joining the ranks of PicMonkey, Mail Chimp, and Survey Monkey by starting a second blog called "How About Orangutan." But I still HAVE some!! P.S. FYI, it was at your brother's wedding in 2004. So HA! And, "How About Orangutan" sounds oddly like a midseason sit com! One that is doomed to failure. The pilot would air, followed by two or three more episodes, and then it would be canned. I would watch it. As long as it was on regular cable channels. Premium and I'm out. Thanks for the heads up. I have been so bummed picnik was going away. Super glad they have a replacement site! Also, PicMonkey is great so far. I've been using it lately and, in many ways, I like it better than its predecessor. just tried it and it's great! Would've liked to see the lipstick on your plant though. LOL Orangutan ... I think you have something there ... maybe I'll tagalong and start Chimps and Needles .. The Google+ thing seriously grumped me out, but at least Picasa now has 24 new features brought over from Picnik, for those of you who may have crummy internet and/or can't run flash well. They included HDR and holga and lomo... but only a fraction of everything I loved in Picnik. I'm so glad you told me about PicMonkey! After exploring a little bit, I found that they have all the things I was going to miss most from Picnik- touch-ups, teeth whitening, clone. I'm SO happy! I feel like a diabetic who just discovered Splenda. I had a look at it but found that I can't draw (lines or arrows or colored circles etc) in my photos. Did I miss something or is it just not there? If not that's quiite a flaw, as far as I'm concerned, as I need that for my presentations. How About Orangutan!? I love it. Thanks so much for sharing the PicMonkey love. We here on the team really appreciate you spreading the word amongst your readers. The Monkey is smiling. @Riete, sounds like you're looking for the Overlays tool (known as Stickers on Picnik) We've got Geometric Shapes, Arrows, etc. Please look there. Thanks again for the shoutout!! Love it! I've been into this kind of simple photo editing lately and can't wait to try PicMonkey out. Thanks for introducing it to me! love it! I ´ll try it! Ok, that's funny "organutan!" You are right about oll the monkey business though! Poor giraffes, they feel so left out. Thanks for the tip! I tested quickly and PicMonkey seems like a lot of fun! I will give this tip on my blog too, and link back to this post. You just made my day! I've been grumbling about the loss of Picnik for the past few months and now I'm happy to see that non-professionals still have an option for photo editing. I hope it stays in business! Hehehe! I love it too! How About Orangutan is a winner in my opinion. And you're spot on with the monkeyness of the Internet today. Are the monkeys getting their revenge on all the kittens and LOL cats I wonder? @Riete, oh yay! Pleased you found what you needed. The Monkey is smiling! Wow, thanks for showing us PicMonkey! Latley I have been super obsessed with photography applications/apps, ie, instagram, hipstamatic, frametastic... but this is among my favourites! Thanks! I just tried it and like it a lot. Too bad some of the coolest features put a giant monkey watermark in the corner! Guess I won't be doing any polaroid effects! You think there will be a paid option to get rid of the watermark? Ok broter tanks for sharing this amazing info. . I discovered picmonkey yesterday and spent a couple hours playing around with it. Such fun! I gave myself pink hair in a photo :). yay! I miss PicNic although Be Funky has filled the void somewhat. Thanks for the link to the new site. and yes, I believe "How About Orangutan" is a great idea... yeah. sure. This is awesome! I was wondering what to do after Picnik disappeared..I will give PicMonkey a try! Brenda, no apology needed! I'm really glad you're answering questions, and happy you chimed in! Oh, thanks so much for this -- I was mourning my loss of picnik and dreading learning an alternative -- now, no need! Plus, it's way faster. yay! Thank you for discovering this!!! I was so sad when Picnik refunded my money and told me they were movin'. Love it! Thanks for posting about it! this looks fun! thank you! Jenn - PicMonkey is the BEST website I have every used for photo editing. Thank you for the resource! !